I cleaned it up and got over it. Then I was getting ready to cook dinner when I realized I didn’t have a few ingredients and so I ran to the store. I came back home and started cooking. I then went to get stuff from the fridge to only realize it had gone bad. Curse words again and this time throwing kitchen utensils. I pulled myself together and went with plan B. Then I realized that the salad I was going to make called for olive oil in the dressing, which was lying in clumps at the bottom of the trash can. With a day like that dinner plans were cancelled and I ate these muffins and ice cream for dinner. I mean fruit… check… protein… check…. dairy….. check, check. Peanut Butter Banana Bread and ice cream the most balanced meal ever (not to mention soul sothing and temper mellowing). I love the flavor combonation of banana and peanut butter. In fact a bannna and a spoonful of peanut butter is a standard go to breakfast or snack for me. So this was a perfect twist on that usual staple! Recipe Notes: The orginal recipe called for the peanuts to be cooked in the batter, but I am not a girl who likes my bread that way so I added them to the top. This made the bread look pretty and added crunch to a few bites but not ALL bites. Also for the best banana bread use super black bananas (a tip my Momma taught me). These type of bananas add the most mositure and flavor. To prepare bread, combine first 6 ingredients (through eggs) in a large bowl; beat with a mixer at medium speed. Add granulated and brown sugars; beat until blended. Combine flour and next 7 ingredients (through allspice) in a small bowl. Add flour mixture to banana mixture; beat just until blended. Pour batter into 4 (5 3/4 x 3 x 2) inch mini loaf pans coated with cooking spray. Bake at 350° for 40 minutes or until a wooden pick inserted in center comes out clean. Remove from oven; cool 10 minutes in pan on a wire rack. Remove bread from pan; cool. To prepare glaze, combine powdered sugar, milk, and 1 tablespoon peanut butter in a small bowl, stirring with a whisk. 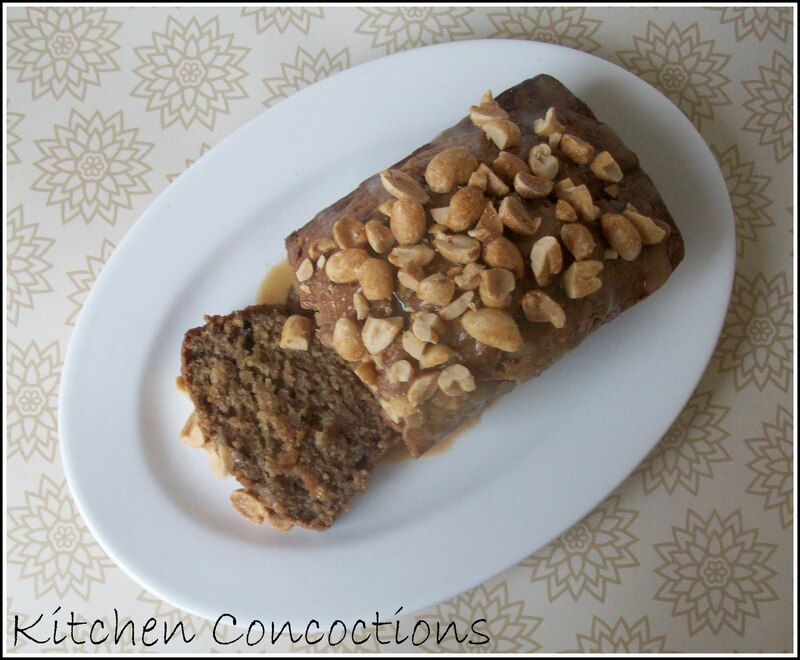 Drizzle glaze over bread and top with peanuts. Yum! I am such a fan of bananas and peanut butter. My mom used to make me a sandwich with the two of them that I loved. 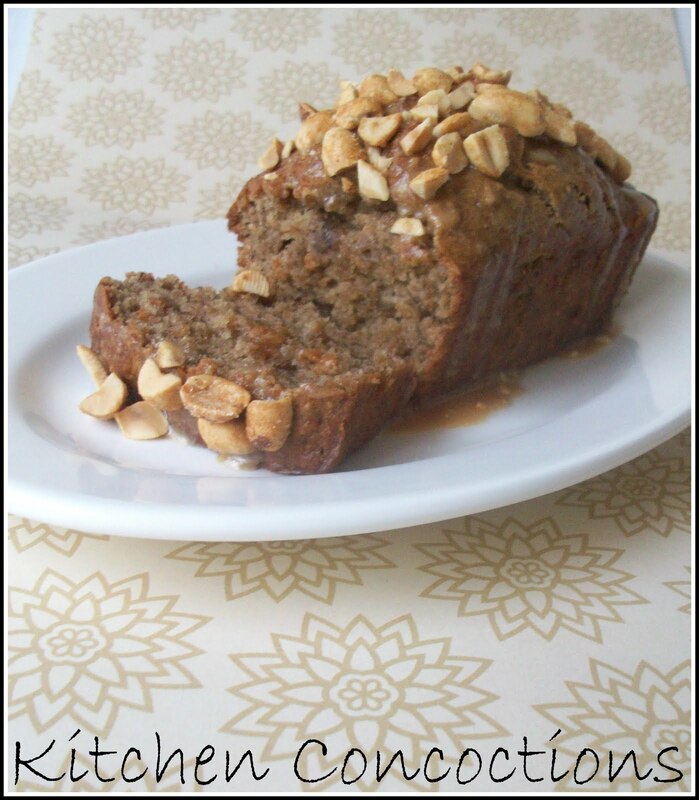 This banana bread is definitely on my "to make" list. Thank you for leaving the link on our blog!